In a large covered pan, cook leeks in 2T butter & wine over low heat until translucent, about 15 minutes. Uncover & remove from heat. Peel off small side muscle attached to scallop & reserve. Combine cream, ¼ c wine, ginger, salt, pepper & nutmeg in a small pan. Add side muscle trimmings and simmer. Reduce by 1/3 (about 15 minutes). Strain & add to leeks. Heat a non-stick pan over high heat & add remaining butter & oil. 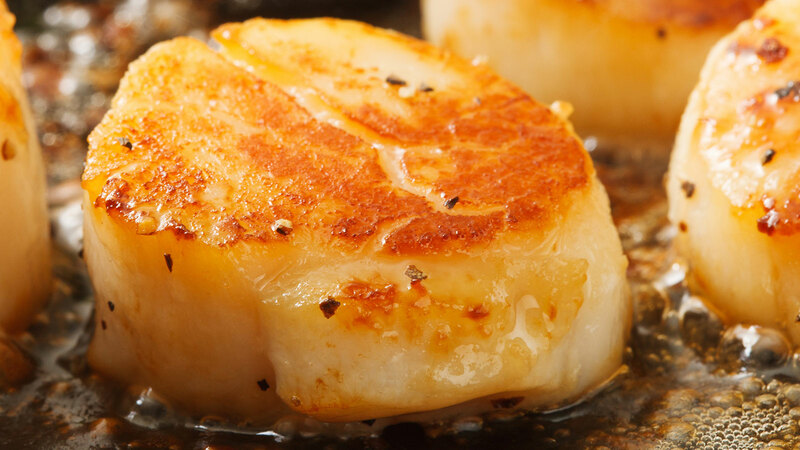 When foam subsides, add scallops a few at a time & sear for a few seconds on each side until light brown in places. Be sure not to cook all the way through. Remove from pan & continue until all are seared. Add scallops and cooking liquid to leeks and gently reheat until scallops are just firm to touch (about 1 minute). Serve 3-4 as a first course, garnished with parsley. This wine is a blend from several vineyards and Pinot noir clones, each of which contributes something unique to the finished wine. Famed the world over, Nuits-Saint-Georges has the original character of a true wine village but the size of a small town. The R Collection Chardonnay is sourced from the finest vineyards throughout California, with each area adding a unique layer into the overall taste profile. Minimally intrusive winemaking techniques allow the true California terroir to shine through in every glass poured and bottle enjoyed. Shipping to OH and NJ is prohibited.